Here are easy magic tricks that you can perform with everyday coins and money. They are all perfect for beginners. Most of this vanishing coin trick relies on a clever gimmick that you make beforehand. Your audience will be wowed with a different way to make a coin disappear. You hold four coins in your hand. As you close your hand and open it again, a single coin has disappeared. Learn how to vanish a coin in this quick trick. With a couple of rings and a playing card, you can easily make a coin disappear. You show two rings, a playing card, and a coin that are sitting on a piece of paper. The rings and playing card are stacked on top of the coin. When a ring and the card are removed, the coin has completely vanished. In the bill roll, you clearly roll two bills together on a table. When you unroll them, the bills have traded places. The bill that was previously on top is now on the bottom and vice versa. This simple trick is easy to learn and perform. All you need are two bills of different denominations and there are no gimmicks, fancy moves, or extra devices. The jumping paper clips is a classic trick that is great for young kids. Just about every magician has played with it at one time or another. In the effect, a pair of paper clips is attached to a dollar bill. After pulling the ends of the dollar bill, the paper clips link and jump from the dollar. In this vanish, a coin is placed into a handkerchief where it mysteriously disappears. You can perform this one just about anytime, anywhere. All you need is a quarter, a handkerchief, and that special secret. Here's an offbeat, easy magic trick where you literally ​see with your fingers. The magician will have a spectator randomly select a coin from several that are in a bag or bowl. With a marker, the spectator writes their initials on the coin. The spectator concentrates on the coin for a few seconds and places it with the others inside of the bowl. Without looking, the magician is able to immediately reach into the bowl and pull out the selected and marked coin. This basic sleight of hand allows you to make a coin disappear without any accessories. You'll find this foundational move useful as you pursue coin magic. The coin slide is an ultra-simple trick for young kids to learn and perform. It's available from any magic dealer and many toy stores for less than a couple of dollars. A mechanical trick, the effect does all the work to make a coin disappear and reappear. The magic coin dish offers a way to magically multiply money. In the trick, the magician has a spectator carefully count several coins into a dish, which the magician pours back into the spectator's hand. 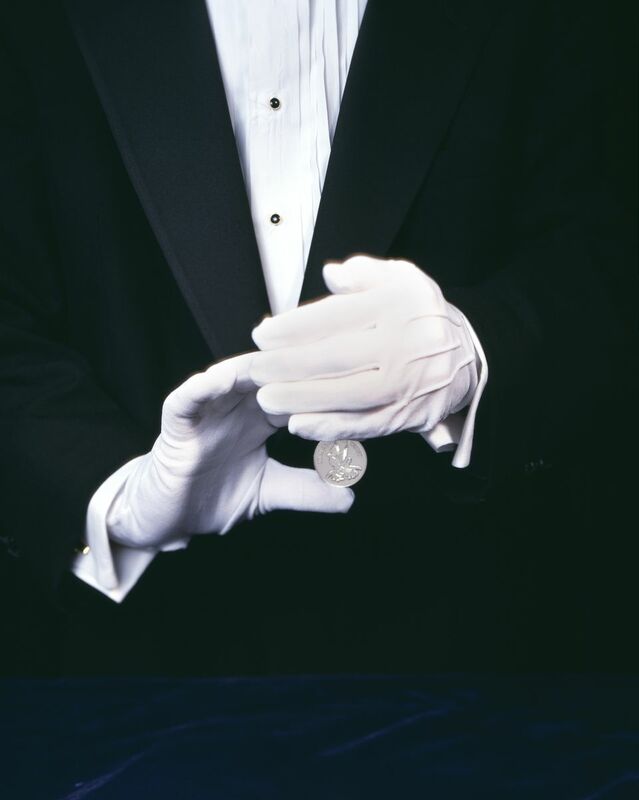 When the audience member opens their hand later, they'll find more coins than were originally counted.